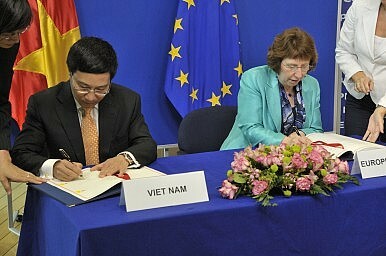 Vietnam and the European Union inking a historic agreement back in 2012. The EU-Vietnam FTA has been concluded. Vietnam and the European Union inked a new free trade agreement (FTA) Tuesday in a move both sides hailed as a boost for ties as well as the EU’s relationship with Southeast Asia more generally. The signing of the Vietnam-EU FTA was long-expected. Negotiations officially began back in 2012 and the two sides agreed on the substance of the deal in August this year, leaving just the specifics of the final legal texts to be ironed out. The pact is a boost for relations between the two sides. As Jean-Claude Juncker, president of the European Commission, pointed out in a statement, an EU-Vietnam FTA will improve access to each other’s markets, help trigger a new wave of investments in both directions and also support Vietnam’s transition towards a more competitive economy. More specifically, Vietnam’s fast-growing market of over 90 million people looks attractive for EU exporters and investors, while Hanoi sees inking FTAs with various actors – ranging from South Korea to the 11 other members of the Trans-Pacific Partnership (TPP) – as a way to boost its economy and integrate it more deeply into the world (See: “Vietnam, South Korea Ink New Free Trade Pact”). The FTA’s signing this month is also symbolically significant because it comes just as both sides commemorate the 25th anniversary of their relationship. It is also a milestone for relations between the EU and the Association of Southeast Asian Nations (ASEAN) more generally. The FTA is the second that the EU has concluded with a Southeast Asian state (the first being with Singapore) and builds towards the ultimate goal of an ASEAN-EU region-to-region free trade agreement. As I have pointed out elsewhere, concluding such an agreement would be one of several milestones that will help strengthen ties (See: “Sustaining Europe’s Pivot to Asia: The ASEAN-EU Dimension”). The EU also termed the agreement the most ambitious and comprehensive FTA it has ever concluded with a developing country. In a statement, the EU Trade Commissioner Cecilia Malmström stressed that the deal, which was supported by an updated investment dispute resolution system, also had a strong focus on both respecting workers’ rights as well as supporting a sustainable management of natural resources. “The agreement provides a new model for trade policy and developing countries,” Malmström said. In their joint declaration following the signing of the pact, both countries indicated that their goal was to finalize the ratification process as soon as possible so the agreement can enter into force in early 2018. Apart from the conclusion of the pact, the two sides also discussed other aspects of their relationship as well, including the EU’s support for legal institution reforms and sustainable development in Vietnam as well as joint cooperation on issues ranging from the migration and refugee crisis to the maintenance of peace, security and freedom in the South China Sea. What’s the Future of Mainland Southeast Asia’s Garment Industry? New research reveals that the prospects are quite bright.